If you don’t like the white crust for your pizza, this is the best whole wheat crust you can make. Also instead to add sugar you can add honey for sweetness and a better aroma. Dissolve sugar in water and add yeast. Stir gently until disssolved (about 1 minute). Let stand until the yeast foams slightly (about 5 minutes) to insure that the yeast is effective. Combine 3 cups of the flour and salt in a large bowl. Pour in the yeast mixture and oil if you are using it. Begin kneading the mixture, gradually adding enough of the remaining 1/4 cup flour so that the dough is no longer sticky. Continue kneading until the dough is smooth and elastic (another 10−15 minutes by hand). Shape dough into a ball and put in an oiled bowl, turning the dough to coat it with the oil. 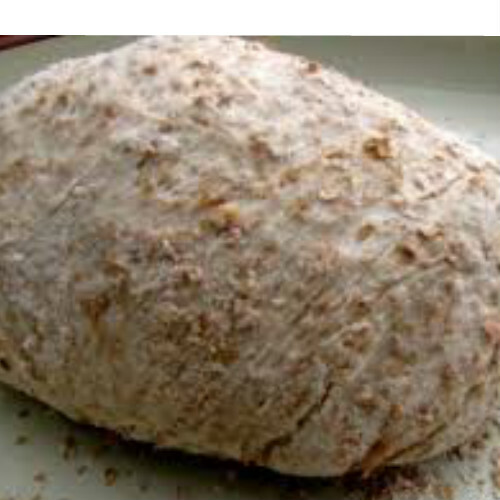 Let rise until doubled in bulk (45 minutes to 1−1/2 hours, depending on the yeast and the temperature). Punch down the dough and shape into 1 or 2 pieces. The entire recipe will make two 12 inch pizzas. 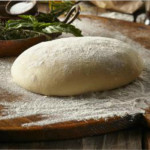 Shape the dough either by hand or with a rolling pin, stretching out as necessary to achieve a thin dough. For a lighter crust, let the dough sit for a half hour after shaping before constructing pizza and baking. 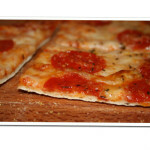 Its a very good dough if you want to eat a healthier crust with your pizza. 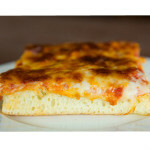 You can put on the crust many vegetables and different kinds of cheese.